The wifi has been up and down all conference, but just got some hints from the Network service desk at floor 2. 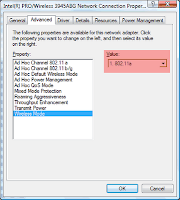 Change the Wireless Mode to 802.11a. The wifi seems to work better with these setting. Please add comments on how to change these settings on a Mac. Screen shot taken from Windows Vista. *Wifi still shaky thought, but better than with the old settings. Här finns eventuellt en lösning, lite gammal artikel dock.